One of the first thing young adults learn when entering the job market is who you know is just as important as what you know. Owen Sound Attack center Steven Shipley has taken that lesson to heart. A 6-foot-2, 205-pound playmaker, he spent part of last summer skating with Hart and Art Ross trophy winner Joe Thornton. It helps that the pair hail from nearby towns -- Thornton is from London, Ont., while Shipley is from neighboring Ilderton. 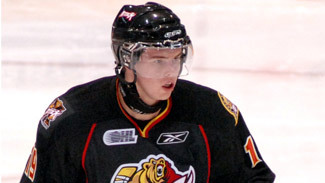 And there's also this: "My agent is John Thornton, his brother," Shipley told NHL.com. Like we said, it's who you know. Shipley is working on building his own name this season. Ranked No. 43 by NHL Central Scouting on its final list of North American skaters available for the 2010 Entry Draft, he had 23 goals and 63 points in 68 games. He's taken advantage of the summer shinny games with Thornton to admire the way the five-time NHL All-Star plays. "Just the way he sees the ice and reads the play," Shipley said. "His wingers that are out there, they have to be ready because he's going to put the puck on their sticks. He's one of the top playmakers in the NHL right now. … It's one of those things where he wouldn't be looking at you and there it would be right on your tape and you'd be right in front of the net." Shipley is working to replicate those qualities in his own game. "Steven is a hard-working guy who knows how to play a role," Central Scouting's Chris Edwards, who specializes in OHL prospects, told NHL.com. "He is an excellent penalty killer, knows how to get himself between the shooter and the net. He blocks a lot of shots. He uses his size very well and protects the puck and he will take it to the net." Owen Sound coach Mark Reeds has used Shipley at center and left wing, and he's also a key penalty killer. "He's a big, strong center, and we've been using him on left wing, he has some versatility," Reeds told NHL.com. "He's a powerful, strong skater with good skills. He can take the puck to the net, and defensively he's another guy we rely on heavily for penalty killing." Much like Thornton, who is big and strong but not necessarily known as a physical player -- although Thornton finished 2009-10 with a career-best 113 hits, it was the first time he's broken triple-figures in the category -- Shipley believes his game will improve if he can add more of an edge to his game. "I think I need a more physical edge to my game, be more of a physical presence out there, be a little more nasty, finish my checks," Shipley said. Turning into that kind of player is accomplished, Reeds said, in two ways. "It's just engaging (physically) more often," he said. "Just get him to engage. We want him to engage as much as possible. Make the physical contact, use your body, to be taking pucks away from people, turning on people, using your size and strength as an advantage. … It's really about just continuing to impress on him to engage and continue to get involved." There's also a confidence factor that comes into play with work off the ice, which Reeds said Shipley also is learning about. "I think all the young guys have to continue to get into the gym," he said. "A lot of young guys don't realize how incredible the human body is and how much it can do. It's getting bigger and stronger and working on your conditioning. We would like to see him be a bull in a china shop." Shipley has heard those words and has tried to put them into his game. "I've never been a guy that's ran around looking for hits, but that's something they expect from you at the next level, to finish your checks, and that's what I need to work on," he said.